L’iluy Nishmas Eyal Yifrah, Gilad Shaar, and Naftali Fraenkel, sponsored by Miriam bas Chava Mindel. He tells us that every time you are given the opportunity to pass judgment on another, know that it is actually your own actions you are judging. The other person’s actions might be obviously similar to your own, or they might be related in ways you find difficult to fathom. You might read about them in the newspaper, you might hear about them from a friend, or you might be a witness to them. You may feel annoyed, upset, or angry with the person or you may simply feel an urge to condemn them. If you do, you condemn yourself in the chambers of the Heavenly Courts, says Chassidus. However, if you are able to squelch the desire to adjudge, attack, or accuse; if you reach deep into your heart to be dan l’chaf zchut (give the benefit of the doubt, see their merits, not their faults); if you are able to turn away from the negative and seek and find only the good points in that person, then the positive judgment you pass is on yourself. It sometimes feels like it isn’t possible to look for the good in others, it requires too much effort. Expressing negative judgment, whether through open condemnation or snide remarks, can easily become habitual. (After all, snarkyism is everyday fare in the predominant culture’s media.) Besides, even if we manage to control our mouths, we might really harbor hatred in our minds and hearts. Remember, that one person is is filling in for you. If you pass judgment, it’s still your court case, your decree. You might possibly be forfeiting your own acquittal. HaShem Himself is intent on constantly looking for our good, and Hashem is our greatest role model. In fact, one of the reasons why Hashem reveals His particular actions to us throughout the Torah is in order for us to emulate them. Not for His sake, however, but for our own sake, the sake of our personal spiritual growth. 2. Remind yourself that unlike Hashem, Who is able to see the good inside each of us, we aren’t omnipotent. We are bound by time and space. Therefore, it is completely impossible for us to know every thought or feeling another person has had or every action he has done. We are only capable of judging the person as he is in only one or two moments in time. 7. Once you’ve mastered the art of being dan l’chaf zchut, of giving benefit of the doubt to others and finding their good points, don’t forget to do the same for yourself. Remind yourself of all the good deeds you’ve done, your generosity, the effort you make to help another. If you can’t recall grand good deeds, think of all the little ones. Did you light Shabbat candles last Shabbat? Did you cook a meal for your family? Did you do your best at work, making sure to fulfill your obligation to do the job your employer expects of you? Did you pay for the groceries on your way home (you probably didn’t steal them)! Did you pray today, even briefly? Think of all the good deeds you’ve done, no matter how small. 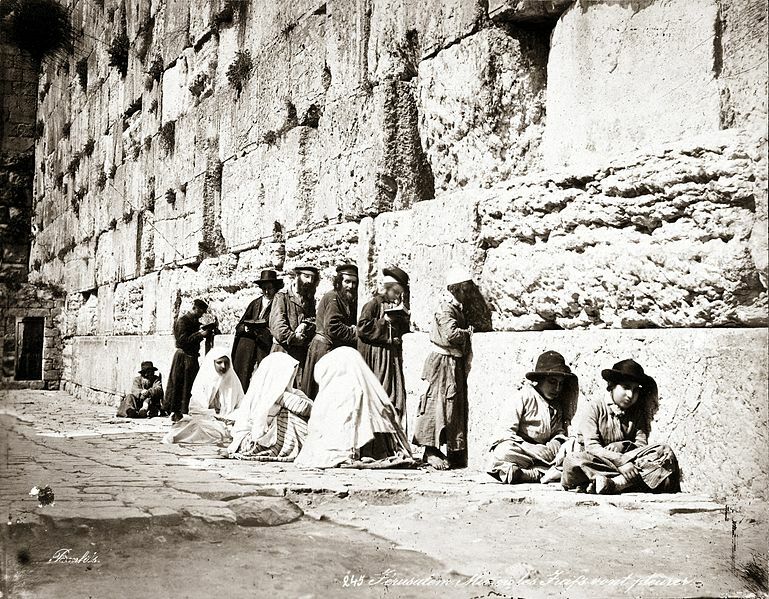 Photo from the 1870s of Jews praying at the Kosel (Western Wall) by Felix Bonfils. If you’d like to sponsor or dedicate this series (or an article or series on another topic) or schedule a class, workshop, or talk, or if you’d like to join the Brooklyn Breslov class, please contact me at: chayarivka @ breslovwoman.org for details.